Chinese-made VHF and UHF hand-held radios are no longer the novelty they were a few years ago when I discovered the Jingtong JT-208 and got one to try. They are no longer the shoddily made bits of junk the Jingtong was, either. Some Chinese makes like Wouxun are now directly imported into the UK and USA so unadventurous buyers don't have to take chances on eBay. But there are better bargains and more choices to be had if you use the auction site. When I saw a smartly styled compact VHF handheld radio transceiver 136-174MHz being sold for only £40 it looked like just the job for keeping downstairs to monitor my Echolink node and acting as a backup radio for WOTA activations so I decided to order one. Shipping from Hong Kong took one week. 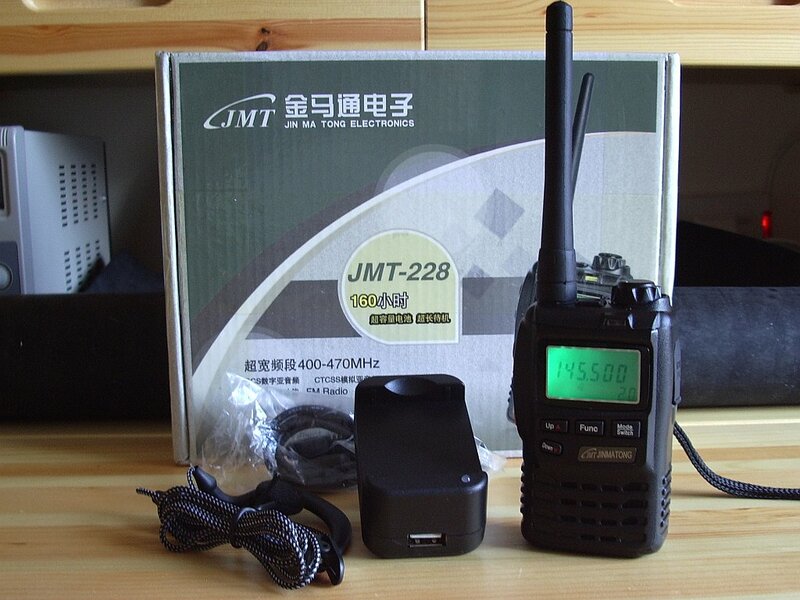 The radio is a model JMT-228 and is made made by Jin Ma Tong Electronics, which is not a company Google has much information about. Whilst tearing off the wrapping I experienced a heart-sinking feeling as the box was revealed together with the description "400-470MHz." I was afraid the seller had sent the wrong model! Inspection of the manual revealed the radio comes in VHF and UHF versions, and when I looked at the back of the radio the label showed "136.000-174.000MHz." What a relief! Together with the radio and manual, the box contains a short helical antenna, a metal belt clip, a carrying strap, a 1500mAhH 3.7V Li-Ion battery pack similar to those used in mobile phones and digital cameras, a 100 - 240V AC charger with fold-out US-style mains plug, a USB cable (presumably used only for charging as there is no mention in the manual of programming software) and a hands-free style speaker microphone terminated in a 2.5mm stereo jack. The JMT-228 is very light (the manual amusingly gives the weight as 200kg including the battery!) and looks rather similar to the early Yaesu VX models. It's a bit smaller than the compact VX-8GR as you can see from the photograph below. The build quality seems very good. The radio is built on a die cast chassis as you can see when you put in the battery. It doesn't have quite the same solid feel as a Yaesu but the light weight is a bonus. The belt clip is metal but a bit flimsy and it is fixed to the radio using one screw. There is no retaining lug (although the clip has a hole for one) so unless you tighten the screw so hard you risk stripping the threads it could rotate allowing the radio to fall off the belt. The glass in front of the display is actually plastic which scratches rather easily - there are a couple of dings in it already that I don't remember doing. A small thing perhaps and forgiveable at the price but something many hams won't think about as we take the high quality of ham radio products for granted. No claims are made that the radio is waterproof. Indeed, the manual warns: "Never expose the transceiver to rain, wet areas or any liquids, or it may be damaged. However, the speaker/mic and USB/charger sockets have stout rubber covers and another page in the manual states: "The transceiver is not fully water-resistant while using the speaker/microphone" which implies that it could be. 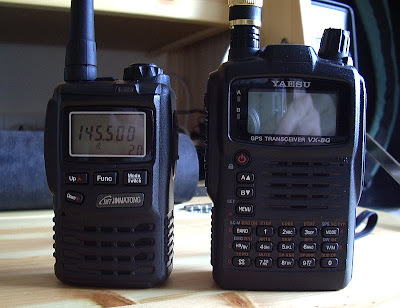 The JMT-228 certainly doesn't look any less waterproof than the Yaesu VX-8GR so it could probably withstand the odd rain shower, but don't quote me on that as I haven't tried getting it wet just to see what happens. The manual is in Chinese and English. The English part is well written for a Chinese radio, though the most important part, describing the "Auxiliary Fuctions" (sic) is squashed into two pages and less well written so you need to do some guesswork to determine some of the functions. RC sets the CTS or DCS tones for receive, TC sets them for transmit. TOT sets a time-out timer. OFFS sets the direction of offset for repeater use, a different menu OST sets the amount of the offset. There are 99 memories and they store the offset and tone settings in force at the time of programming. It took only a few minutes to enter in the 2m simplex channels, the three local repeaters and my Echolink node settings. Memory mode is clearly the way to use this radio on the amateur bands as it does not have automatic repeater shift as found on dedicated ham radios. There is a scan mode, which simply scans all the memories. There is also an FM Radio mode that lets you listen to Band 2 FM radio frequencies. The sound quality isn't the greatest for listening to Classic FM or BBC Radio 3, but it's usable. The antenna socket is an SMA type. Surprisingly for a Chinese made radio it is an SMA female, the same as that used on radios from Yaesu, Icom and Kenwood, so you can use the same SMA-M accessory antennas you could use on those radios. I can even use my SMA to BNC adapters! The supplied antenna is 4 inches long, presumably a helical whip, and fairly broadband with the best match, a 1.6:1 SWR, at 156 MHz. This isn't going to be optimum (tests I have carried out in the past have showed that a noticeable benefit is gained by tuning short helical antennas to match the frequency of use) but it is no worse than the antennas supplied with Kenwood handhelds and only to be expected in a radio designed to operate over such a wide band. There is no low power setting, which is a bit of a disappointment and will not help battery conservation. On receive, however, the radio seems to run forever, helped no doubt by a quite severe power saver mode. This does not appear to be user configurable nor can it be disabled so you could not use this radio to receive packet or APRS. The modulation using the internal microphone is OK, but a bit on the low side. Using the included speaker/mic it is a bit better. 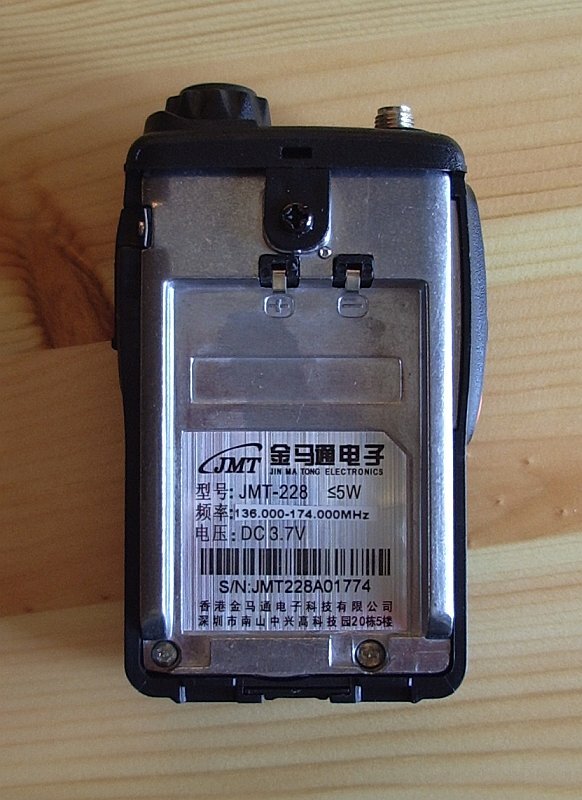 Note that although this speaker/mic is similar to a hands-free mobile phone kit, the JMT-228 transceiver does not have VOX, so it is necessary to key the transmitter by pressing the button on the back of the mic. Here are some audio recordings of the JMT-228, with a couple of other hand-held radios for comparison purposes. As you can hear, the audio level is similar to the Motorola GP300, another radio designed for use on the professional high bands. Amateur band radios tend to have a higher modulation similar to the TH-205E. When using the speaker/mic I found that the transceiver tended to lock in transmit - presumably due to RF getting into the speaker/mic cable which is right next to the antenna. This is a bit of an annoyance, which could possibly be cured using a really small snap-on ferrite if I had one. Despite a few niggles I think the Jin Ma Tong JMT-228 transceiver is a nice little radio and would be a good buy for anyone wanting an inexpensive and compact transceiver for use in the amateur 2m band. I think the Chinese are going to own the market for basic single or dual band handhelds very shortly and people will only buy from the specialist manufacturers if they need specialist functionality such as APRS, wide band scanning, a short wave receiver or even, dare I say it, D-Star. I recently bought an NKT-R3 from HK via eBay for around £30 delivered. It's a robust little 70cm and PMR (wideband) handheld, with a body that's an accurate copy of a Yaesu VX-3. It puts out 2w and has good audio on RX and TX. I"m really impressed with it. I agree that if the Chinese keep improving as they have done over the past few years, the Japanese are going to have to really specialise to stay in this market segment. Yes, I saw that little radio. If I wanted a 70cm radio I'd certainly get one, but nobody uses 70cm round here so it wouldn't be much use to me. I yesterday read about the 2m JMT-228 - although i noticed that the ebay picture for the device yields another brand name (that I can not read). This seems to be a device that is a total blind shot on google, I only found this blog even mentioning it in context... not even a single review on eham. I'd really like to learn more about this item until it arrives in about 2-3 weeks. I'd be glad to test the "side transmissions" of this and some other cheap HTs on the market using a spectrum analyzer though... I alsways suspect some transmissions that are not quite wanted. Thats an argument that is often yielded by people, that get annoyed by people using cheap stuff, while they paid 300$ for their HT at I-Com/Yaesu/Kenwood. "It has to have bad filters", "It has to transmit out of the ham band all the time" ... and so on. Maybe thei are right... currently I am lacking the equiptment to verify that, sadly. Nearly forgot: You are doing a great job, informing about interesting topics. I'd really like to go portable QRP in the future and have ambitions on buying a FT-817 for that. Its very helping to read about your experiences :) Thanks a lot. I will be interested to hear how you get on with the JMT-228. Mine arrived in a week. No it does not have a 1750Hz tone. It's not necessary in the UK - all our 2m repeaters use CTCSS access tones. If any still support a 1750Hz toneburst it's only for the benefit of people using antiques. In Germany, or at least in my location near cologne, most 70cm and 2m repeaters still use 1750Hz Tone bursts - most do not support CTCSS even less or none use DCS. Since most of my radios output the tone locally while sending, it has gone deep into my mind :). I will train a bit to whistle then. Thanks for the info. "The belt clip is metal but a bit flimsy and it is fixed to the radio using one screw. There is no retaining lug (although the clip has a hole for one) so unless you tighten the screw so hard you risk stripping the threads it could rotate allowing the radio to fall off the belt." Mine in fact has a metal retaining lug. The piece of plastic, where the hole on the radio is can be taken out in my model, revealing 3 metal bumps that keep the belt clip steady. I found this out by mistake while taking off the clip to save space. When I loosened the screw, the little piece of plastic came off all by itself. Maybe its the same with yours. My radio looks exactly like yours btw, only the brand name is "Shouao" and the model is "TS-3R". I would be very glad to know, to which mobile phone or camera or whatever the battery is compatible. I could not figure that out by myself. Well spotted! My piece of plastic comes off too and the belt clip is now much more positively located and is tight against the back of the battery so it will do a much better job of keeping the radio on a belt. I don't know anything about a compatible battery for it. I guess if I needed one I would take it to a mobile phone shop. But the radio runs for ages on standby. It is a pity there is no TX low power setting. The TX audio is a bit low. I have had comments about that. Did you get an accessory earpiece/mic with yours? That is a bit better. The squelch tail is very loud, which is a bit annoying. But I am still very pleased with the little radio. From this page which I found using a search for the name of your version, it appears that the power level is selectable. Does your manual explain how to do this? I have the manual here at work and just went through it again - no remark about power level adjustment. You may contact me through my profile if you like - I just made scans of the relevant pages of the Shouao TS-R3 Manual. I also tried most of the imaginable power on key combinations, function key combinations and "hidden" menu feature possibilities... I suppose, since the page you mentioned says "High power output: 2W,Low power output:0.5W. (ctomized)", it has to be factory programmed to support low power operation. About your earlier request - I did not yet receive reports about audio. I checked for audio quality and levels using simplex to my car radio only, there the modulation was as loud and clear as from my TH-F7, but perhaps I have to mention that I am used to hold the mics quite near to the mouth all the time (like eating them ;)) - I will report that on my (new) blog when I have tested the HT. Thanks for you interest and support so far, Julian.